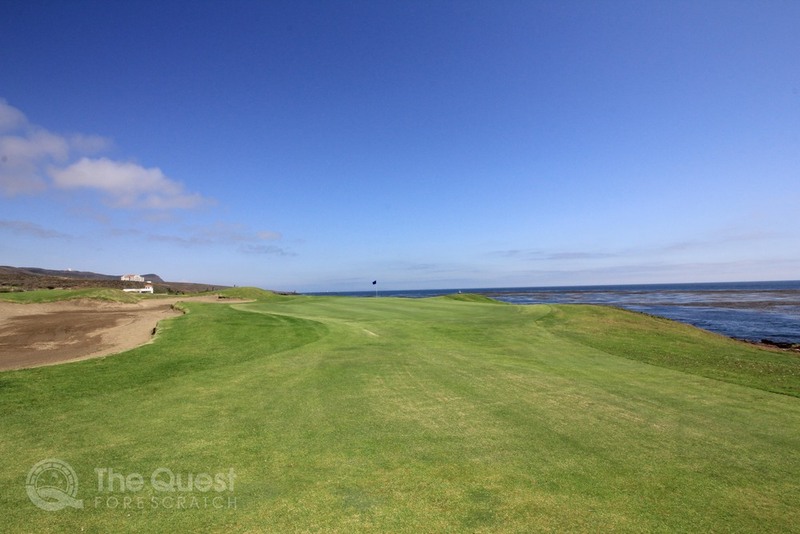 “The Pebble Beach South of the Border”, as named by FORE Magazine (most likely many years ago since I can't seem to locate the article that references this quote). As you know, things in golf change quickly, which we all learned from 'Tiger Wood's recent slide of form. 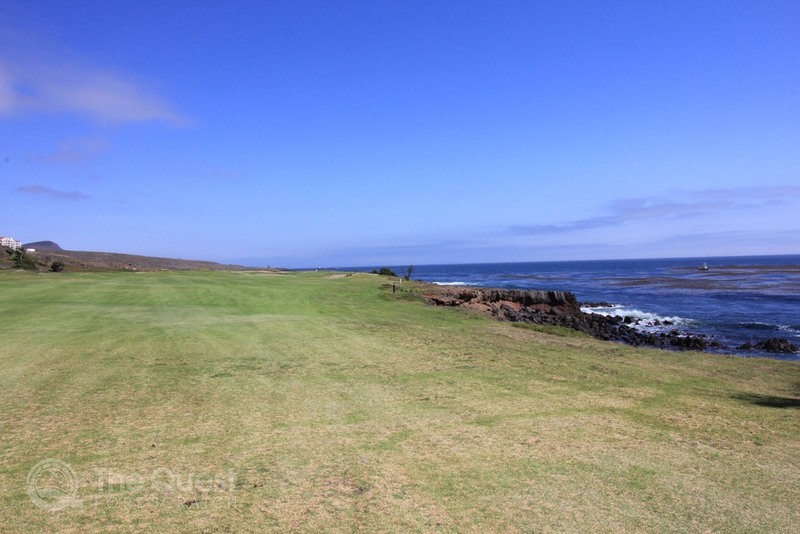 I would like to coin a new phrase, Poor Man's Pebble Beach, based on the current condition of the course and overall value compared to similar beach-front courses. If you are going to be related to Pebble Beach, you might want to act the part. Now I am not going to rip into the course, completely. I understand that exterior environmental things happen that are beyond a course's control. 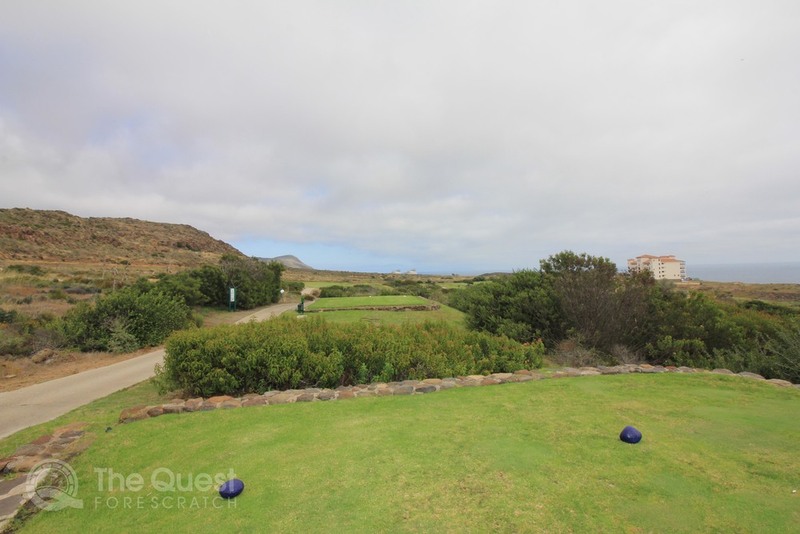 However, it would not take much effort to return the course to a suitable condition that would get people excited about returning to Bajamar year after year, price tag and all. The course views are spectacular, it really has the makings of a global golf destination. With a little attention to detail, it could rival Pebble Beach. Well, at least be a sister and not a 4th cousin. I would certainly put this course on a monthly rotation, especially for those who live in San Diego, if improvements are made. I encourage you to try this course, at least once in your lifetime. Don't take my review as a negative, it's quite positive in regards to a golfer perspective. 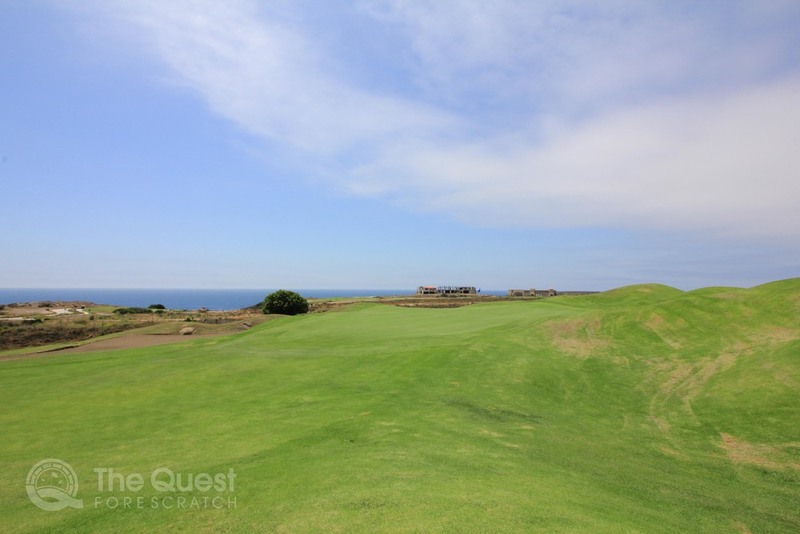 If you don't play golf regularly you will most likely think this course is at least 4 star, especially with the panoramic views of the Pacific and cheap cervezas. We started our travels from San Diego to Bajamar (Baja California) late in the morning. We reached the boarder crossing around 11AM and it was very easy to cross into Mexico. Follow the signs to Ensenada. We decided to travel the tollroad, make sure to carry about $5 for the toll road fees down. You will also need the same amount on your return, unless you take the free route. Once on the open road, the traffic flows very well. Our estimated total travel time was just under two hours. On the return make sure to spend enough money at the resort (with golf this should not be an issue), you will receive a fast pass from the resort to cross the boarder back into the US, well worth the investment to save at least an hour of your life. Be very aware of your surrounding when visiting Mexico! 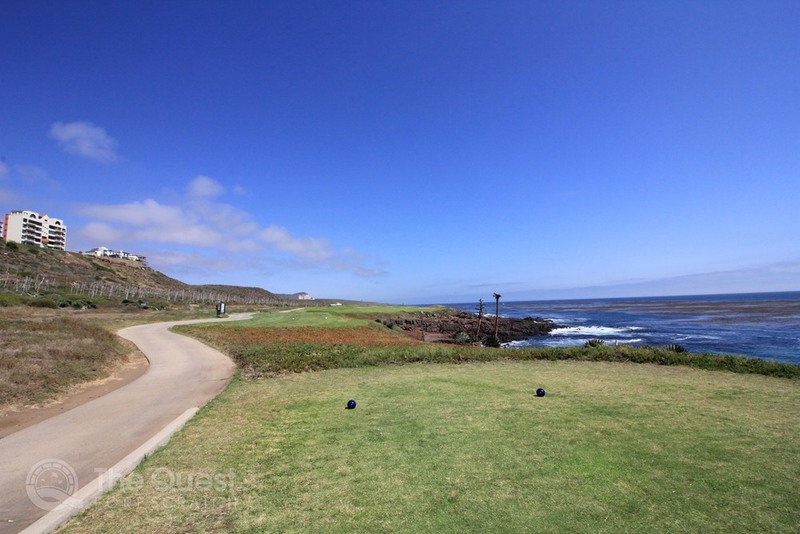 Bajamar started development in 1975 by the development group, Groupo Valcas out of Tijuana Mexico and offically opened the doors for golf in 1976. The current owners are comprised of three different companies, Grupo Mega Turi-smo, Bay View Grand and Groupo Valcas. The original owner had grand ideas for the area, which included a master plan community that currently surrounds the course today. The course that exist today is 27 holes, with an original 36 hole plan that never came to fruition. It seems there is a new shark in the waters, and he goes be the name of Greg Norman. 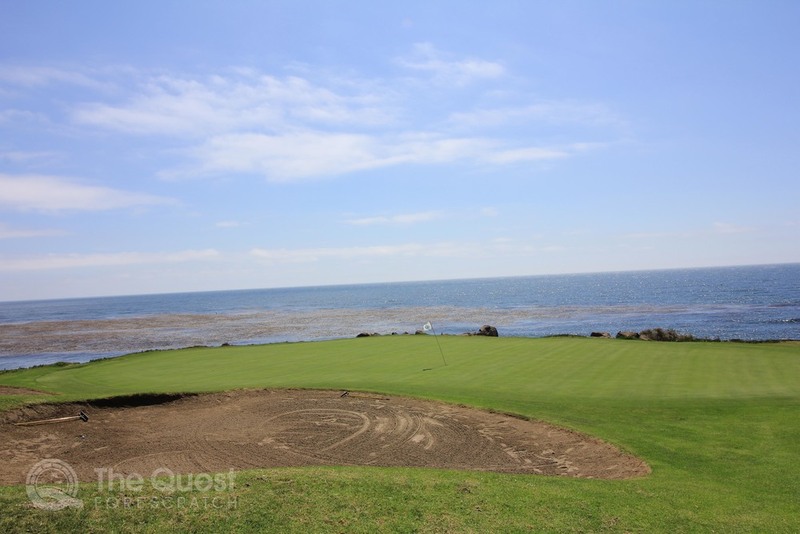 Apparently there was a recent ceremony that involving Mr. Norman and BVG's top level executives to officially announce the plans to build a new 17 hole championship course that is in close proximity to the existing 27 hole ocean front course. 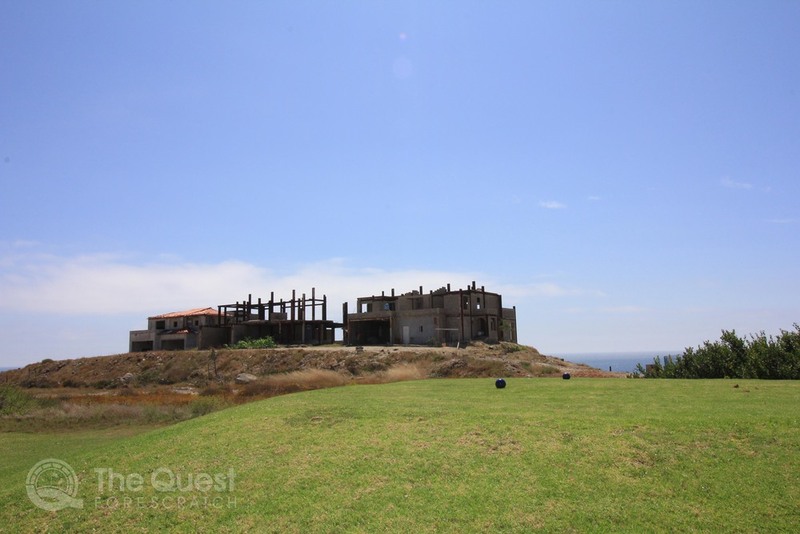 According to the Greg Norman's website the construction began in 2008, however at the time of our visit there was no signs of construction and little said about a new project from the Director of Golf at Bajamar. We will just have to wait to see what the future holds for the area. There is relatively little to say about the practice area, it failed to impress like other high end golf courses north of the boarder that charge similar green fees. The range seemed a bit like Tin Cup; the balls looked like they were just fished out of the lake, with many of the range balls having noticeable blemishes, I was expecting a VW bug range picker to drive out of the bushes at any moment. 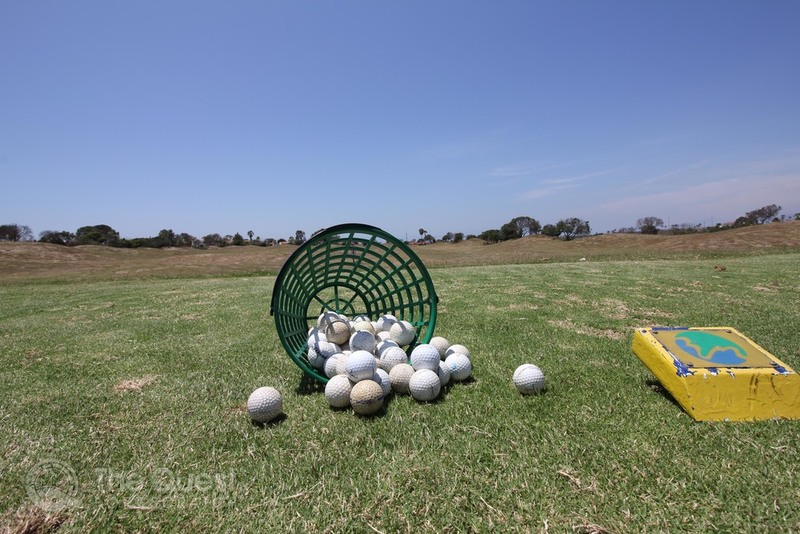 The balls were not included in your greens fees, and even at $5 dollars (for a small bucket) it may have been better to scrounge a dozen balls out of my bag from bush hunts along the way to get a proper ball in hand for the warm-up. The bunker area was not well kept, it looked like it had not been mowed in quite some time. The view from the practice bunker was the only thing worth mentioning. Lastly, the practice green was very nice, too nice compared to the greens that were actually on the course for the weekend. 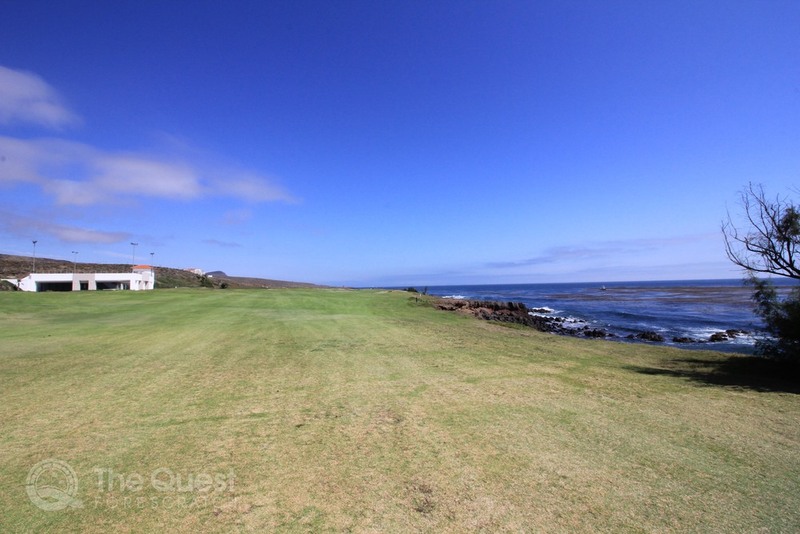 If they could somehow update the practice area, they really are sitting on a goldmine on the Baja coast. 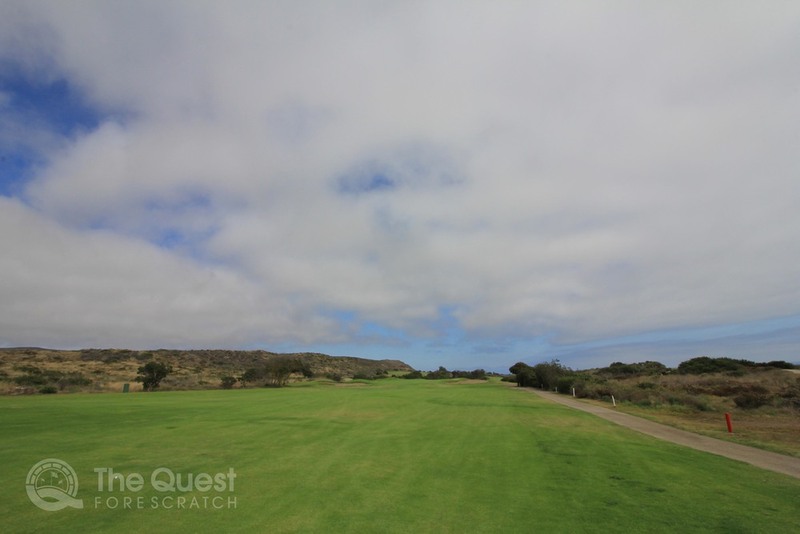 Hole 1 Par 4 – Bring your wind game and a punch shot, this will require two hefty shots to reach this green in regulation. 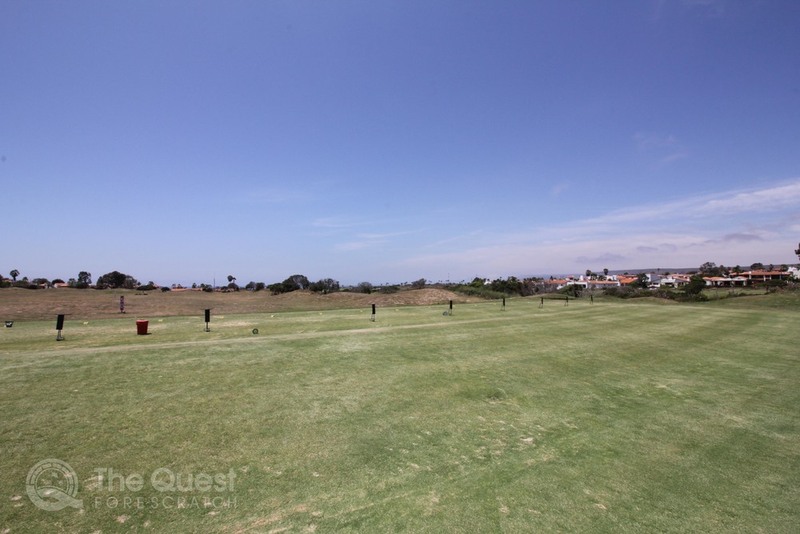 Hole 2 Par 4 – This shot goes into the wind as well, long iron or 5-wood is a good choice. 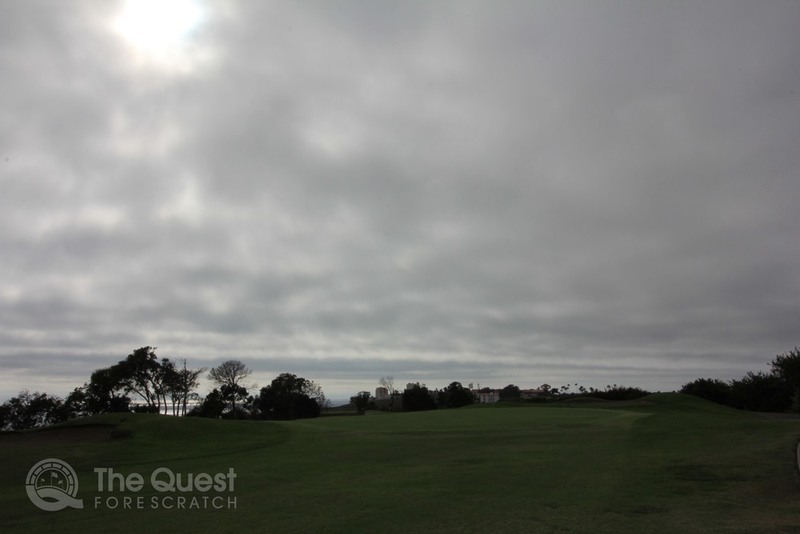 Play your shot to the left side of the fairway since right is not a happy place. Avoid any and all bunker on this hole, actually avoid any bunker on this course in general. 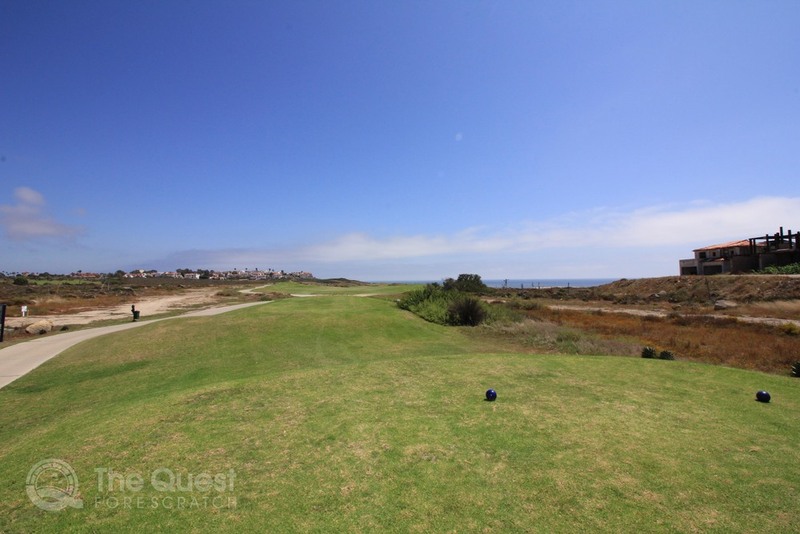 Hole 3 Par 4 – This is a blind tee shot, aim to the hills on the left side of the fairway and you will get a generous kick to the right. If you decide to challenge to bunkers on the right side of the fairway, make sure the wind is not blowing. Right is NO GOOD! 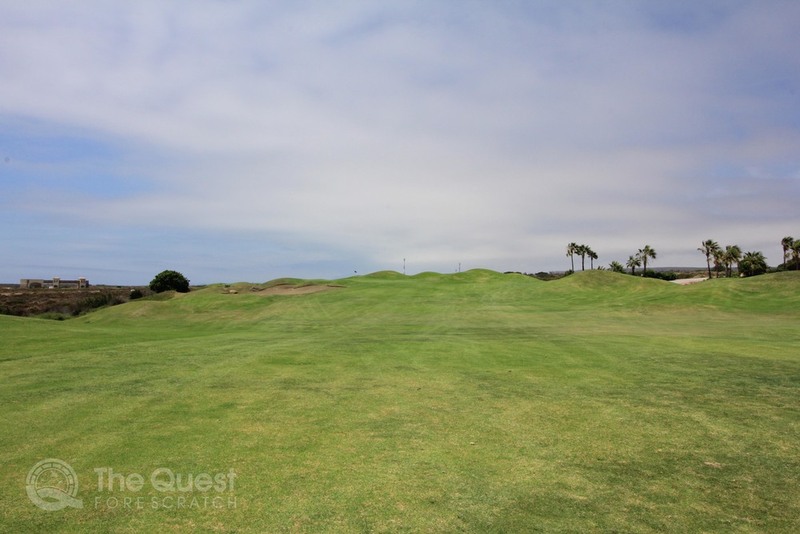 Hole 4 Par 4 – Consider using a 5-wood or long iron on this short par 4. If you use your driver you can reach the canyon that divides the fairway from the green, you will most likely be dropping. Fun canyon approach shot makes this hole great. 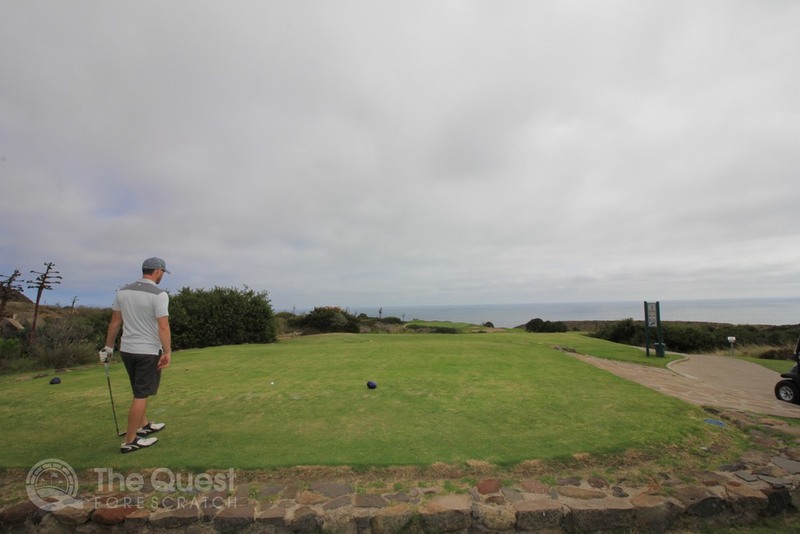 Hole 5 Par 3 – Take a minute to admire the view! 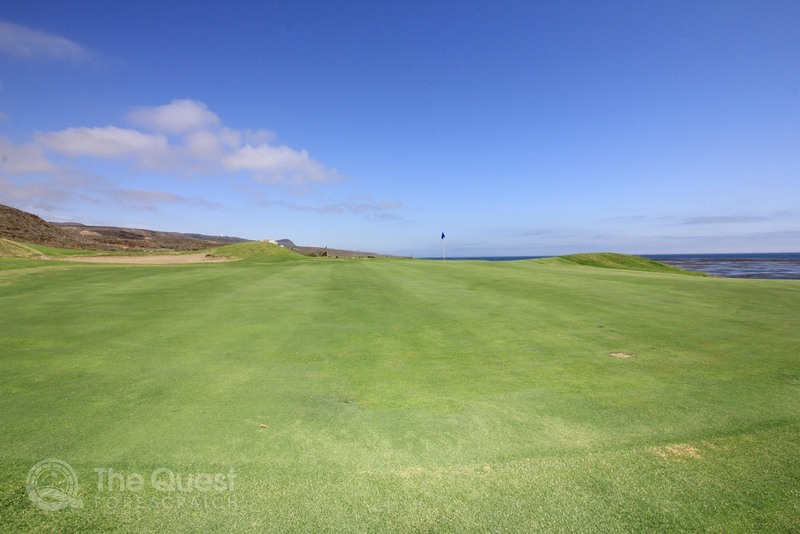 This magnificent hole is by far the best hole on the course, choose your iron wisely or suffer the consequences of the Pacific Ocean. Hole 6 Par 4 – Fire away with your driver down the lefts side, beware you slicers, this stretch of holes can make or break your round. 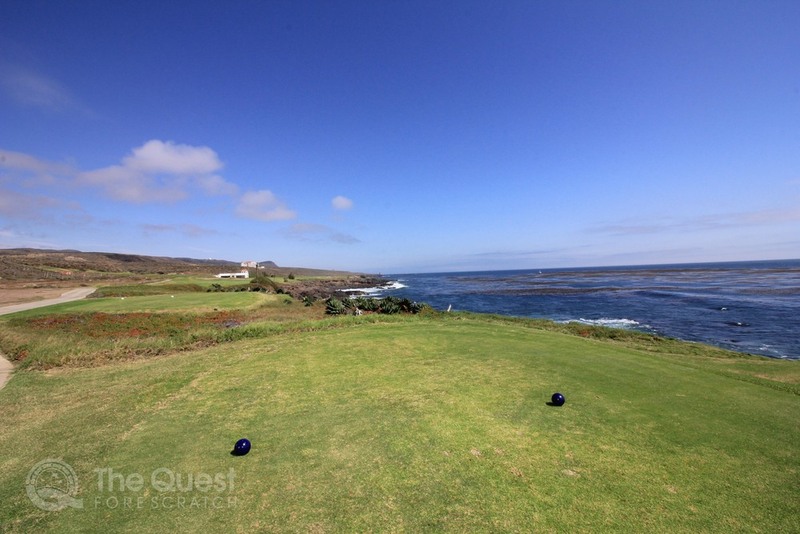 If you hit a fade there is a good chance that your ball will meet its final resting place in the Pacific. 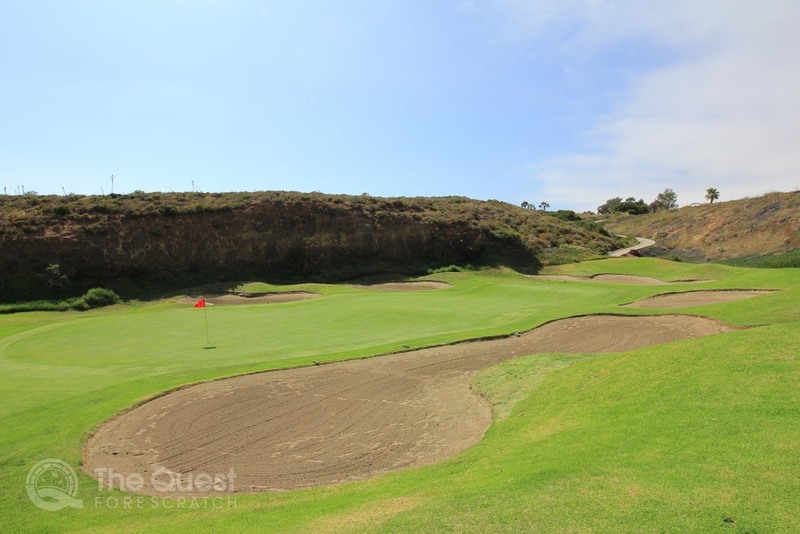 Hole 7 Par 4 – Grip and rip this shot, send your ball right between the gap of the left and right bunker. This hole should play much easier than the other ocean holes with bunkers that will keep you out of trouble. Hole 8 Par 5 – Woot, this is a fun hole! Bring out the big dog if you are feeling adventurous; give it a rip right over the ocean, only if you drive it 300+ yards. For us shorter hitters aim left and avoid the water at all cost, there is not a lot of trouble hitting left. There is a good chance you can get a birdie here. 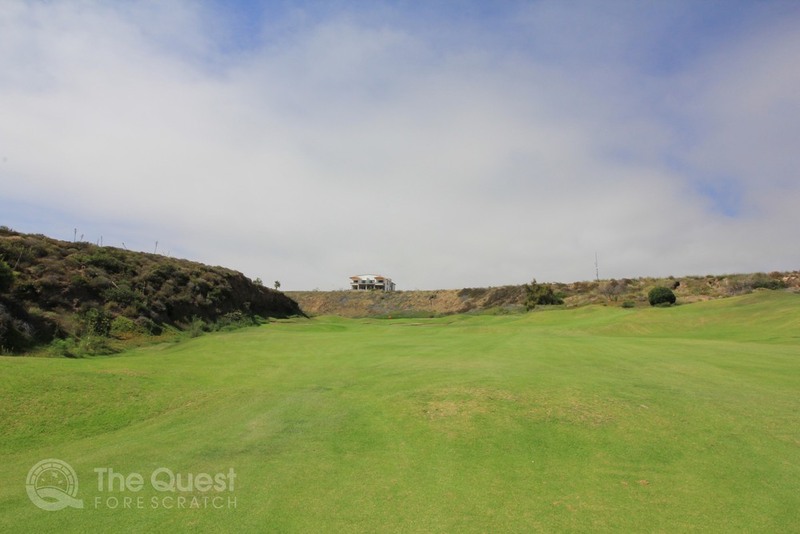 Hole 9 Par 4 – This one is all up hill, and if you have any chance to birdie this side, this hole would be it! The three-tiered green is the best green on the course. 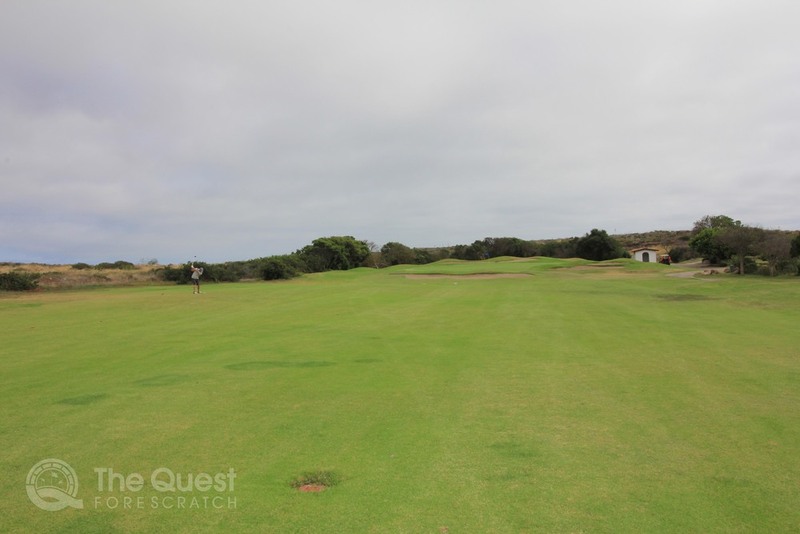 Hole 1 Par 4 – Don't be shy, aim a little left and hit a slight cut down the left side and you will be left with a short approach shot to the green! Hole 2 Par 5 – A par 5 that requires a bit of imagination. The tee shot is pretty straightforward, it's the approach shot that will leave you wondering if you can make it in two. The smart play is to lay up with a PW or 9-iron, but you did not come all the way to Mexico to layup. Give the green a go, it's well worth the rush for a blind second shot that has to clear the water in front of the green. You got this! 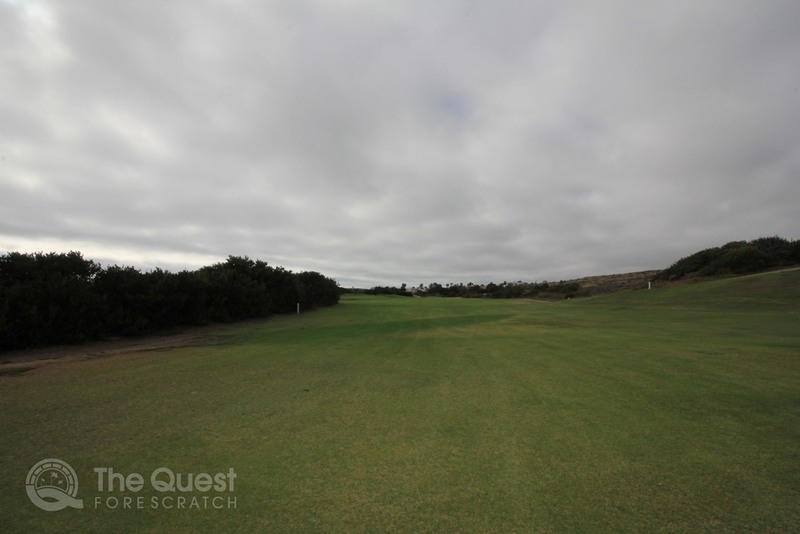 Hole 3 Par 3 – Club down, you are heading down hill and a very short iron will do for this hole. Hole 4 Par 5 – Here is another birdie hole, give it all you got, hit down the left center cut and you will have a long wood or iron into the green, most likely this will be a three shot hole if the wind is blowing. A birdie is definitely in order after you eagled the last par 5;) You stud! 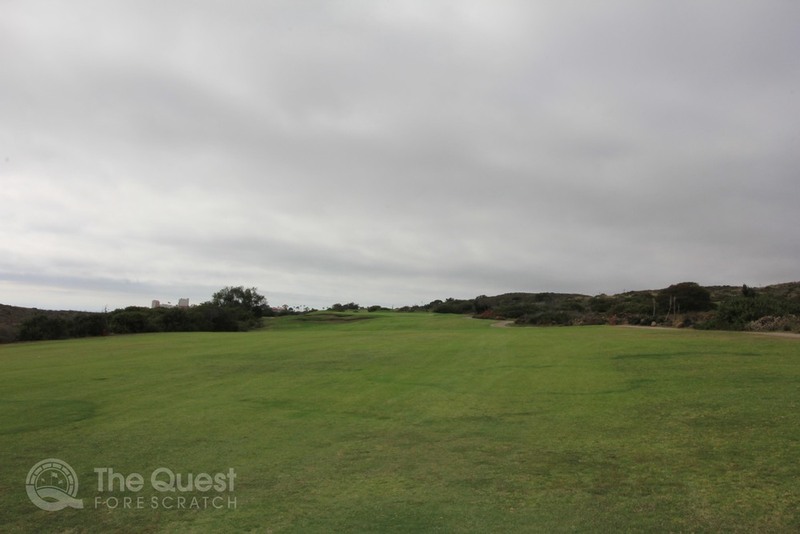 Hole 5 Par 4 – Relatively short, however wind is always a factor. If you get your ball moving right it will most likely end in the bunker or worse yet into the Mexican outback. 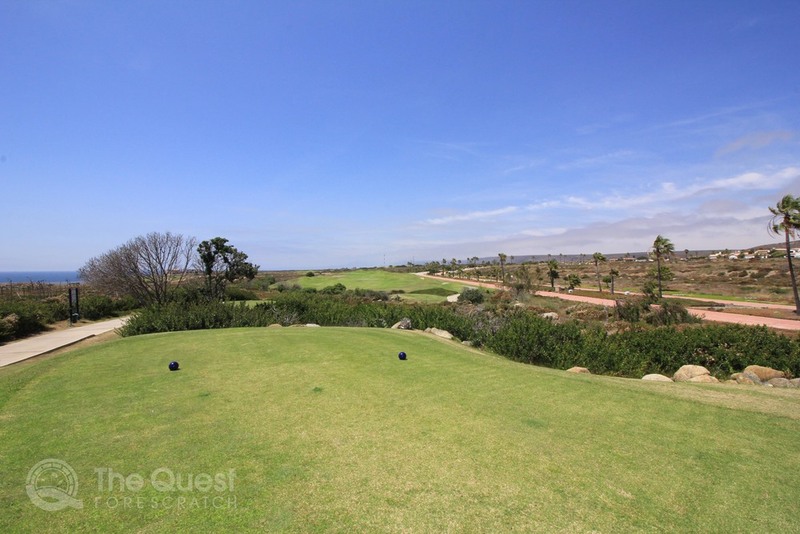 Hole 6 Par 4 – One of the shortest holes on Vista, give this one a rip with your driver. Finally a hole that will seem somewhat normal under the windy conditions. Hole 7 Par 4 – This is a hallway hole (narrow fairway), make sure to give it a go with your driver and leave it on the right side of the fairway for a clear view of the green for your approach. If you end up on the left side you will have to deal with the tall bushes that will hinder a fade shot. Only shot from the left side of the fairway is a draw, especially if the pin is tucked in the back left corner of the green. Hole 8 Par 3 – A slight downhill par 3 that will give you some relief, especially if you blew up the last hole. 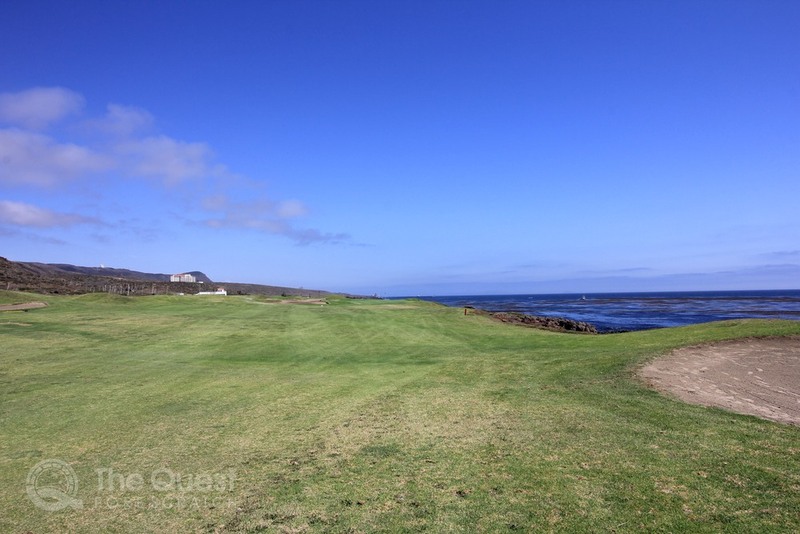 Hole 9 Par 4 – Your last chance for glory! 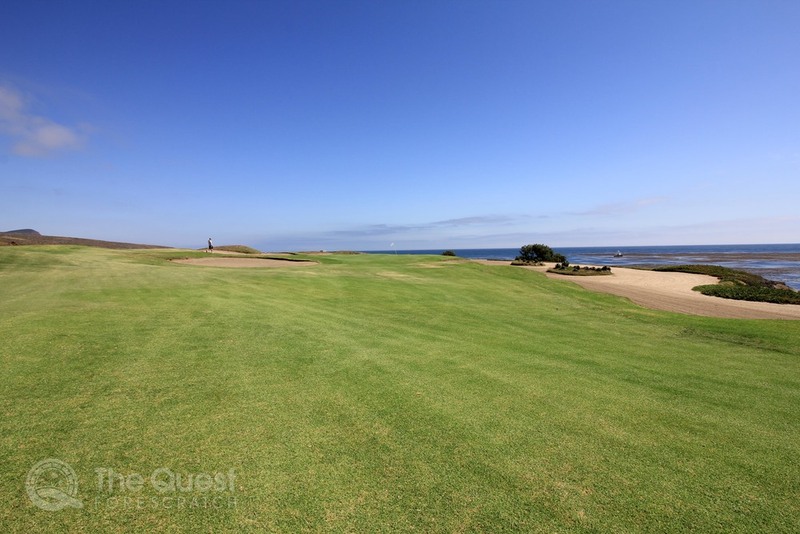 Give this one all you have since it's a long par 4 and the last hole for your round at Bajamar. Bunkers guard this hole behind and left of the green, a slight miss of the green to the right won't hurt you. The bunkers! Bring an old wedge because it's about to get beat down if you have a day at the beach. I look forward to visiting Bajamar again next year and thanks for having me!